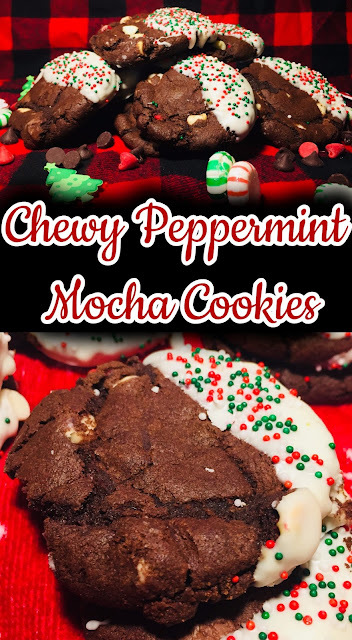 Your favorite coffeehouse drink in a cookie form, peppermint, chocolate with a touch of coffee to give you a cozy feeling. When I hear about anything with peppermint and/or chocolate I always think of the holidays. They have out anything peppermint with chocolate. Personally, peppermint and chocolate its not my favorite flavor combo but this was requested by my niece and nephews who love peppermint and chocolate together. They get the chocolate covered mints every time we go out to dinner. This post I had my little helper again, my niece. She was so excited when I asked her if she wanted to help make these cookies. What is your favorite Christmas or holiday flavor? Let me know in the comments. 1. In a medium size bowl, whisk together cocoa powder, flour, baking soda, baking powder and salt. Set aside. In a microwave safe bowl, melt 2 cups semi-sweet chocolate chips for 1 to 2 minutes in 30 second intervals. Let it cool slightly. 2. In a large bowl on high speed, cream together brown sugar, granulated sugar and butter for 5 minutes. Add vanilla extract, peppermint extract, brewed coffee and cooled melted chocolate. 3. Lower the speed of your mixture and slowly add into third of the cocoa flour mixture then two eggs. Add in the second-third of the flour then the last two eggs. 4. Toss white chocolate and milk chocolate into the last third of flour then flour into batter. Cover then chill for at least 3 hours, I recommend having the dough chill overnight for a better peppermint flavor. If chilling overnight, take cookie dough out at least 1 hour until baking. 5. Preheat oven to 325 degrees. Line cookie sheets with parchment paper. Scoop cookie dough out with a 1 1/2 tablespoon cookie scoop or two scoops. Make sure they are at least 1-inch apart. Bake for 9 minutes, rotating halfway through. 6. Let cookies cool on pan for 5 minutes before removing to wired rack. Let them cool completely before dipping. 7. In another microwave safe bowl, melt two cups of white chocolate chips and tablespoon of coconut oil. Microwave for 1 to 2 minutes in 30 second intervals. Stir every 30 seconds. 8. If children are decorating, make sure to have adult supervision the chocolate will be hot when dipping. Dip each cookie into chocolate then place onto parchment paper. Sprinkle on crushed candy canes or sprinkles as you place the cookies back on the parchment for the sprinkles to stick. Let set for 15 to 20 minutes before enjoying. I didn't get the chance to attend a cookie swap party this year, but these cookies would have been perfect! Thanks for sharing your recipe. These are so festive and who doesn't love a cookie dipped in white chocolate! Holidays are my favorites because we get to eat all this fabulous treats with those we love. Really enjoying your recipe thanks! Such a festive and fun cookie for the holiday! These look amazing!!! I can't wait to try making them! Love the half dipped look with sprinkles....and of course the chocolate. These look delicious! I love all the flavors during the holidays like ginger, cinnamon, peppermint. Yum yum yum! These look great!! Peppermint Mocha sounds like a good combo. I'm a huge fan of peppermint and chocolate. Just can't get enough in December. These cookies sound super simple and easy to make. Thanks for sharing! My favorite holiday flavor is actually peppemint mocha. Just something about the blend of the chocolate, hint of coffee, and the fresh coolness of the peppermint. I love how festive these look! The peppermint and chocolate combination is a perfect choice for the holidays too. YUM! These look like delicious treats for the winter! I love the addition of the white chocolate chips. These cookies look so chocolatey I need a plate of them with a tall glass of milk and I'll be ready to face the weekend. I'm with you - I'm not personally that into minty chocolate, but my Hubby and kids sure are! That said, I make this type of treat just for them! These cookies look festive and yummy! These look so delicious and festive. I would love to try your chewy peppermint mocha cookies, it will great for gifting! Theses look so good for the holidays! I love when cookies are dipped in chocolate or in this case peppermint white chocolate. I will make sure to pin this recipe for later so I can find it again! I love minty cookies, well minty anything really. So this is for sure going in my folder of cookies to make. These sound so good. I am all about some peppermint this time of year. And chocolate.... yum! I’m not a coffee drinker but these look delicious! I might have to give them a try. Oh man, these cookies look delightful and delicious. omg you make the best desserts...my mouth is drooling looking at the photos! You are one talented woman!!! These look good even if I don't dip them. I looked in my cupboard earlier today though and found out I don't have any chocolate chips. This delicious recipe is going to have to wait.